Two guesses who I'd like to see? I think the great nephew of the Lone Ranger would be a great fit at Dynamite. That's right the young boy in the LR comic grows up to be the father of the Green Hornet. The only connection that Zorro's Black Whip had with Zorro was the title. Linda Stirling played a character called the Black Whip. She was a veteran of many serials and pretty good considering the material she had to work with. It appears Paul Renaud could be working on Zorro although Iâ€™m not sure in what capacity? On his forum Renaud posted this sketch. Anyone Got Pics of the Cassaday Cover? the weakest of the 3 covers if you ask me... but that is the good thing about multiple covers. Just looking for clarification, is the entire series 8 issues or just Wagner's part of it and then it would continue with someone else at the helm? I believe Zorro is intended as an ongoing, with an 8-issue opening arc by Wagner. Whether or not Wagner is intended to stay on beyond that, I don't know. Zorro #1 Five Page Preview! Looks interesting so far, not sure which cover I want to get they are all great! I'm mostly torn between Wagner's whose kind of the creative impulse behind the whole thing, but the blue eyed Zorro ain't working for me. I love the in your face Mayhew Cover, at least he gave him brown eyes. What really kills me on all of them is Zorro without a mustache, I can barely stand to look at him, it's like seeing a fox without a tail. But Wagner assures there's some explanation for it. Cassaday's cover is pretty fun but I'm already getting Lone Ranger so I'll give one of the new guy's a shot. The interiors look great, it's always striking to see so much color on Francavilla's black and whites, but they've definitely captured the mood, the setup appeares reminiscent of the opening of the original Curse of Capistrano and the first Mark of Zorro, where the army discus the demon dressed in black. Loved the first shots of Zorro's appearance, this is definitely a darker take on the character, I'm a little frightened for the soldiers. The little flash back scene with the two boys sitting around the fire, I imagine that is a young Diego and his "brother" Bernardo visiting his mothers tribe, and that is Diego's Grandmother "White Owl ?" standing in the distance. I can't tell who is narrating so far, Diego, Bernardo? I can't wait to see, read, believe more! Last edited by Guicho; 02-20-2008, 01:44 AM. Damn that was good, I finally got my copy today, that preview had pages out of sequence? Wagner dips heavily into Allende's novel but puts his own twist on everything making it all new, this is a dark violant world, but theres this playful and innocent sense of adventure coming through, part is Francavilla's beutifull art, and and of course that you're following the young Bernardo & Diego (down the rabit hole), to whom still anything seems possible almost fantastic. He reveals the dual natures that will become Zorro, from his father (old world)honor from his mother (new world) justice, and from his spirit guide the cleverness he will need to become the fox. Wagner dips heavily into Allende's novel but puts his own twist on everything making it all new, this is a dark violant world, but theres this playful and innocent sense of adventure coming through, part is Francavilla's beutifull art, and of course that you're following the young Bernardo & Diego (down the rabit hole), to whom still anything seems possible almost fantastic. Yes, the previews make me very hopeful for this comic. I do want to see a moustache on zorro soon. A stately moustache of refinement is considered a status symbol during the colonial spanish period. The spanish uniforms, however, are wrong. They need to be fixed, because this is really bad. Maybe the original author wrote all of the spanish as having these types of red coats. It's been a long time since I read that. I dunno! But, ummm, it's historically inaccurate, and being that zorro is historical fiction, it'd be nice to get them fixed. Now, I specifically went through my historical references off the web as well as ON the web and could not find supporting evidence for the current dress of the soldiers. the Americas in the 1800s. They did not all wear the same type of uniform. form of the Louisiana Regiment. These guys wore white with blue facings. uniforms like this, we sort of standardized on it. etc. Anza by then was a Lt. Col and definitely was wearing a blue uniform. The uniforms discussed which had red facings did not look like the uniforms being presented in this comic, i.e. they were not used as a one size fits all uniform and varied depending on the branch of service. Now, in the corresponding emails I was also given pictures of such uniforms, if you'd like me to host the images and link to them I will. 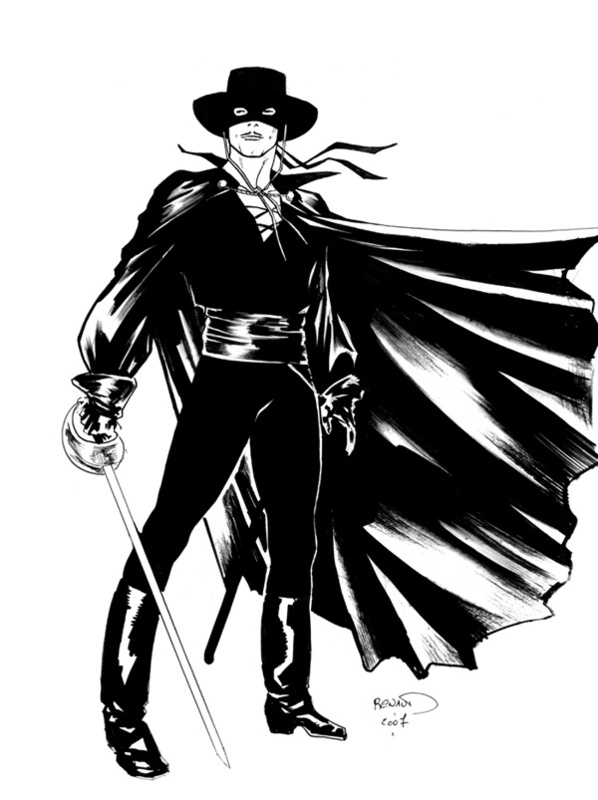 Now we're also talking about Zorro being placed within the historical scope of 1806-1818, despite the original stating it was 1806, the author continually made references to events which occur after 1812. However, even with this, it's post the 1796 era of revolutionary style red long coats with blue overcoats and was phasing into the era of blue overcoat styled infantry. Also, should these soldiers of the pueblo of Riena de Los Angeles be wearing the classical uniforms, we should be seeing the light leather jerkined dragoons. While some militias of Spanish controlled California did wear Red coat version of the standard blue coated infantry, the pueblo of Riena de Los Angeles was large enough to be supplied by troops the local presideos, nixing out these minor militia type characters. Santa Barbara Presidio http://www.sbthp.org/research.htm also has some information on the matter. Basically I'd like to know where the artist or writer got the description for the red coated soldiers (seriously, I want to know if there's a historical reference being made depicting this style of uniform for the major Los Angeles area which I could not find). Historically speaking, Zorro is from an area which "prides itself" on being in line with Spain and the latest spanish fashions. That means either primarily blue coats on the sodiers and especially the infantrymen (of the style depicted here), or older looking revolutionary style long coats (which are not depicted here). He needs a moustache though. A spanish man without a stache is considered just a boy. It's a massive cultural thing here that needs to be corrected in further issues. I can ignore the issue I have with the uniforms, but the stache needs to be fixed. I just got a copy yesterday. I really liked it. The artwork is beautiful and the story well told. Naturally, I want to jump right in and see Zorro doing his thing, but I have a feeling this will be worth the wait.